Tadaharu Yamamoto, president of Yokohama Tire Manufacturing Mississippi L.L.C. WEST POINT, Miss.—Yokohama Tire Corp. is donating $500,000 to two Mississippi colleges for establishing worker training-related courses as part of its preparations for the $300 million truck and bus tire plant that it is building near West Point. Yokohama is donating $250,000 each to East Mississippi Community College and Mississippi State University, according to Tadaharu Yamamoto, president of Yokohama Tire Manufacturing Mississippi L.L.C., the entity set up in Startsville, Miss., to oversee the project. Yamamoto, most recently head of Yokohama Tire Philippines, said the funds are to be used "to help build training programs and develop talent for the work force" for the new plant. Yokohama's plant in West Point, Miss., will cover 1 million square feet and include rubber compounding and warehousing. EMCC President Rick Young said his college would invest the funds into training programs that would "ensure the firm's profitability" as it comes on stream and grows. YTC anticipates hiring up to 500 workers for the plant, which is designed to produce 1 million tires a year in the first phase. Production could quadruple to 4 million tires over time, the company said, and employment could rise to 2,000. 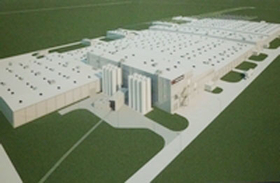 An artist rendering of Yokohama's plant, to be built in West Point, Miss. The investment could top $1 billion if the project goes forward with all the proposed phases. YTC and YTMM officials broke ground on the plant Monday at the project's 570-acre site north of West Point. The plant will cover 1 million square feet in the first phase, YTC said. 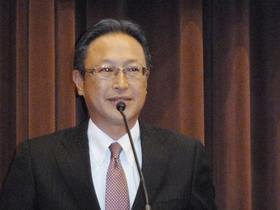 Construction is set to begin shortly, Yamamoto said, and be completed by early 2015. Initial tire production is expected by October 2015, which would represent the fastest construction time of any Yokohama plant to date. This will be Yokohama Rubber Co. Ltd.'s fourth dedicated truck and bus tire plant worldwide, joining two in Japan and one in Thailand. YTC also sources some truck tires from its GTY Tire Co. joint venture with Continental A.G. in Mount Vernon, Ill. The company has not yet disclosed the plant's specific product mix, but it appears wide-base singles likely won't be part of the mix in the first phase, according to comments by YTC and YTMM executives during activities in West Point leading up to the ground-breaking.